Superior Livestock Auction kicks off their two day Gulf Coast Classic this morning at 8 AM Central Time- 57,100 head to sell today and tomorrow- click or tap here for details about this sale. on Wednesday at OKC West Livestock in El Reno, compared to last week's sale. Click here to jump to yesterday's complete sale report. FedCattleExchange.com offered 513 head Wednesday with 0 cattle actually selling. Click here to see their complete market results. The grand opening of the 2019 Oklahoma City Farm Show is at 9 AM this morning at the Bennett Event Center in State Fair Park in Oklahoma City. 350 exhibitors featuring over 1,000 product lines for three big days. Exhibits include all of the latest in agriculture with a full line of displays, including tractor, sprayer, tillage, harvest equipment, cattle management products, and more. In addition to indoor and outdoor exhibits, daily horse training seminars, cattle chute demonstrations and prize drawings make the Oklahoma City Farm Show a don't-miss event. As it has been every year since the start of the Oklahoma City Farm Show- Admission and parking are free. We look forward to seeing you at the 2019 OKlahoma City Farm Show- as I mentioned above- our booth is 805- stop by and say HOWDY! Make Plans to attend the Oklahoma City Farm Show, coming April 4th, 5th and 6th 2019. Admission and Parking are free. Exhibits include all of the latest in agriculture with a full line of displays, including tractor, sprayer, tillage, harvest equipment, cattle management products, and more. In addition to indoor and outdoor exhibits, daily horse training seminars, cattle chute demonstrations, cattle grading competitions, and prize drawings make the Oklahoma Farm Show a don't-miss event. Click here for more details about the 2019 Oklahoma City Farm - presented by Midwest Farm Shows. Early report coming in from Nebraska have estimated that recent flooding has caused the loss of 700,000- maybe even a million head of cattle. Randy Blach, CEO of the market analysis arm of the beef industry CattleFax, says those numbers are probably a bit exaggerated and the Nebraska Department of Agriculture seems to concur. While CattleFax has not yet released an official headcount of cattle lost, their best guess is that the actual number is most likely closer to 100,000 head and perhaps even less than that. Overall, though, Blach says this situation will not have an impact on the market. "It's a severe deal," he said. "I don't know really how many animals have been lost, but I can say the number of animals lost has been devastating to the individual producers. But, for the industry in total, it's not a significant number." Again, Blach contends the market as a whole should not feel much if any impact from this situation. But in Nebraska, he says there are issues developing that are rapidly effecting the performance of the markets locally. According to him, weights have quickly fallen as much as 100 lbs. lighter than they were forecast to be. "It's been very, very difficult on our cow/calf producers, on our feedyards... infrastructure has been washed away in many cases," Blach said. "It's going to take months and months to get back to normal." Listen to Blach's full commentary on the situation in Nebraska on yesterday's Beef Buzz - click here. At the start of 2019, the 27-year AgCredit veteran Patrick Zeka assumed the role of Chief Executive Officer for Oklahoma AgCredit. Earlier this week we got together to discuss the current health of the member-owned cooperative as well as the agricultural industry here in the state. He remarked that despite this lean period in the ag industry, the members of the Oklahoma AgCredit have been fortunate enough to stay within a relatively positive position from a credit perspective. "You never know... you're always just one or two crop failures from problems, but so far things worked out really well," Zeka said, commenting from a lender's perspective on the industry. "Up until probably three months ago, we were all surprised at how well our portfolio was holding up. It just seems in the last couple months, though, we've had some people come in that are finally to their last dollar and needing some help." Zeka says the Oklahoma AgCredit Board of Directors elected to increase its patronage back to members. Last year, the board distributed $5 million in payouts. In 2019, Zeka says that amount was raised to $6 million. In fact, payments from that were scheduled to begin yesterday and continue over the next two weeks. Listen to more of our conversation here, where Zeka goes in depth on member paybacks and the challenges being had on cropping segments. For the second year in a row, the top four leading wheat varieties planted in the state were developed by OSU, according to the April 2019 "Oklahoma Variety Report" from USDA National Agricultural Statistics Service. In addition, another two OSU varieties were listed in the top seven. Gallagher remains the leading variety of all wheat seeded in Oklahoma this year, accounting for the largest percentage of the state's 2019 planted wheat acres. Doublestop CL Plus came in behind Gallagher with an increase in plantings this year compared to last, Bentley held steady in its total acreage planted in third place and Iba placed took the fourth spot with its total acreage falling slightly in 2019. Old standby varieties, Duster and Endurance, came in sixth and seventh on the survey list. Other OSU varieties listed in the survey on Oklahoma planted acres included Ruby Lee, Smith's Gold, Deliver, OK Bullet, Billings and Garrison. According to the Oklahoma Wheat Commission, the roots of success continue to be firmly anchored with several other up-and-coming OSU varieties being adopted by Oklahoma wheat producers. "Thanks to wheat improvement programs like the one at OSU, producers continue to have improved options of wheat varieties to plant," said Mike Schulte, executive director of the OWC. "Whether it is improved stress or pest tolerance or increased yields, at the level of end-use quality expected by our food industry, the Oklahoma Wheat Improvement Team at OSU is working to develop varieties that are meeting producers' changing needs." While OSU wheat varieties are adapted for local growing conditions, they continue to show success being globally marketed. Click here to read more about the OSU derived varieties featured in this report, or to access the actual report from USDA/NASS itself. At AFR Insurance we are proud to have served Oklahomans and their communities for over 100 years. We know that insurance is more than talking about being there for you, it is about actually being there for you. We are here to give you a peace of mind by offering you the best insurance products at an affordable price. 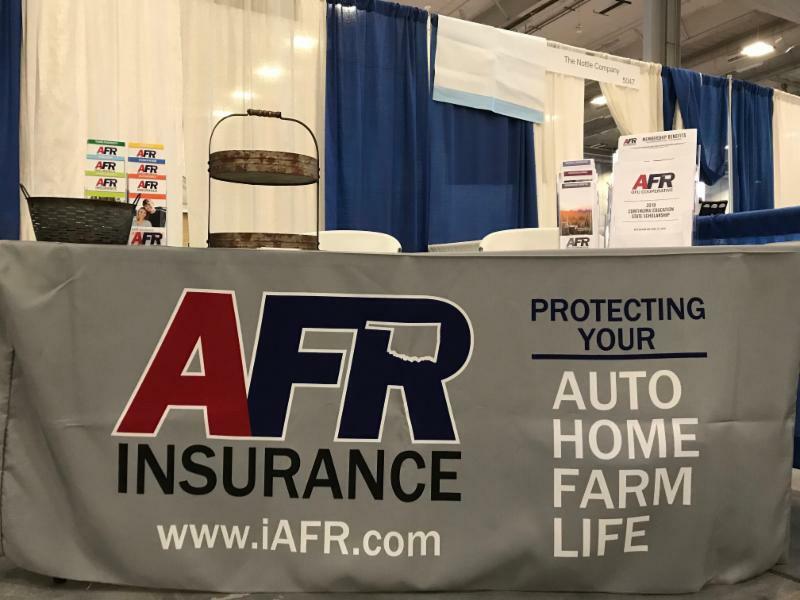 AFR Insurance offers auto, home, farm and life insurance to all generations, from young to old, we are here for you day in and day out. Price. Protection. Peace of Mind. That's AFR Insurance. Visit www.afrmic.com today to find your local agent and get a quick quote today! CoBank quarterly economic reviews provide market outlooks for several topics and industries, including: global and U.S. economic environments, U.S. agricultural markets and rural infrastructure industries. The latest report states that world economic growth has slowed from 3.8 percent in 2017 and 2018, and will likely average between 3 to 3.5 percent. Current trade disputes and global acreage shifts for this crop year may ease some downward pressures on prices. A slowing global economy may force animal protein and dairy sectors to scale back planned production increases as the year unfolds. "U.S. agricultural producers and markets are in for a challenging year with economic uncertainty," said Dan Kowalski, vice president of CoBank's Knowledge Exchange Division. "There are a few bright spots, but growth is likely to average 2 to 2.5 percent with significant volatility in quarterly growth." A recap of the report is provided by clicking or tapping here and the full quarterly U.S. rural economic review, "Agriculture Still Waiting for Relief" is available at cobank.com. We continue our coverage this week of the 2019 Star in Ag Placement finalists with Kaylee Holt of the Shattuck FFA Chapter, representing the Northwest Area. Kaylee is recognized for her work raising and managing the show pig operation, part of Holt Livestock. To perform her duties properly, Kaylee says she has learned the skills necessary to keep any livestock business running smoothly. As a manager, she is involved in all facets of the business which requires her to stay on top of everything from animal health to marketing and customer satisfaction. Her work raising pigs and managing the business components of the operation will help her succeed in the future, she hopes, running her own veterinary practice. You can learn more about her work experience in Ag Placement and that of other finalists we've featured this week, by clicking over to the Blue-Green Gazette on our website. The OSU Animal Science Alumni Association will host its 2019 Gala Reunion on Saturday, April 6, at the ConocoPhillips Alumni Center on the OSU Stillwater Campus. The ASAA invites those interested in attending to join them at this event to celebrate the members of Dr. Bob Totusek Livestock Judging Teams, Dr. Lowell Walters Meat Judging Teams, current animal and food sciences students, the Triple Crown National Champion Judging Teams and the 2019 Hall of Fame Chairback honoree, Dr. Don Gill. Learn more about Animal Science Weekend activities and register for the Online Scholarship Auction and Gala Reunion by visiting www.asaagala.givesmart.com. Click or tap here to read the full article, if you cannot attend, or want to purchase an ASAA Lifetime membership before prices increase at midnight April 6- you can go online. Our thanks to Midwest Farms Shows, P & K Equipment, AFR Insurance, Oklahoma Farm Bureau, Stillwater Milling Company, National Livestock Credit Corporation, Oklahoma Beef Council, Oklahoma AgCredit, Herb's Herb Hemp Farm, the Oklahoma Cattlemens Association, and KIS Futures for their support of our daily Farm News Update. For your convenience, we have our sponsors' websites linked here- just click on their name to jump to their website- check their sites out and let these folks know you appreciate the support of this daily email, as their sponsorship helps us keep this arriving in your inbox on a regular basis- at NO Charge!